Life in India is incomplete without chole (chickpeas). I seriously mean it and you will totally agree with me especially if you are from North India. They are everywhere – weddings, parties, festivals, get-together, road-side etc. 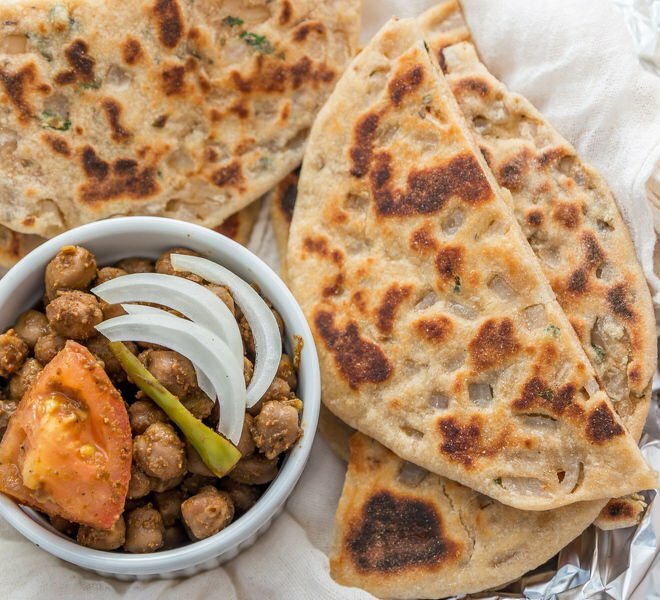 If you have invited someone for lunch you are most likely to make chole, if there’s a festival well you will most definitely make them again. And so because we make them so often we obviously need to have ways to make them differently each time. This is an easy version of chole, since there’s no curry involved it comes together in minutes. 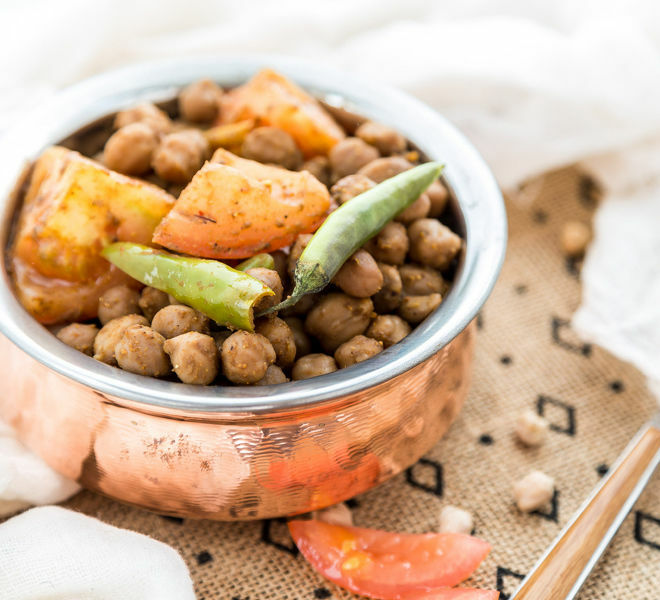 If you are using canned chickpeas it will hardly take 10 minutes for you to prepare this amazingly delicious chickpeas recipe. I am still not used to the canned chickpeas because back home we always use raw chickpeas and I am still stuck with that mindset I guess. So once you have the chickpeas ready, all you need to do is mix them with spices and top them off with some tomatoes (optional). It really is that simple! Soak chickpeas in water for 6 hours or preferably overnight. I soaked 1 cup of raw chickpeas which equals to around 2.5 cups of chickpeas once soaked. 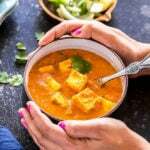 You can straight away use 2.5 cups of canned chickpeas and skip the soaking part. In the morning transfer the chickpeas into a pressure cooker and add enough water. Add bay leaf, cardamom pods, tea bags, black cardamom, cloves and salt. Pressure cook the chickpeas at high flame for 1 whistle and then lower the flame to medium and cook for another 5 minutes. 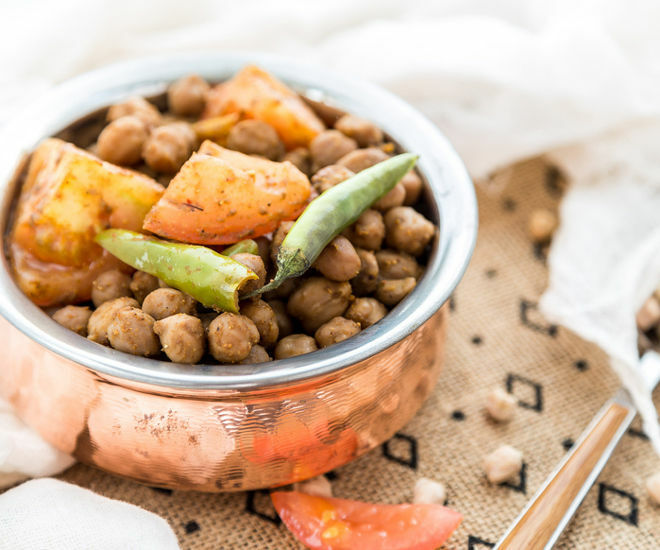 For kadai chole the chickpeas shouldn’t be very soft. If I was making chickpeas curry, I would have let this cook on medium flame for 12-13 minutes but here 5 minutes is fine. Once the chickpeas are done, drain the water and set them aside. Heat ghee and oil in a pan on medium heat. Once hot add the ginger juliennes and sliced green chilli. Once the ginger turns light golden brown add in all the spices and cook for 2 minutes. Add little water [around 1-2 tablespoons] if you think the spices might get burnt. Now add salt and also little water, around 2 tablespoons and cook for 3-4 minutes or till most of the water is absorbed. Add the cubed tomatoes and mix. Cook till tomatoes are little cooked, say around 2-3 minutes. You don’t want to them to be mushy. 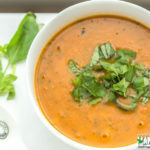 Switch off the flame and garnish with coriander leaves (optional). 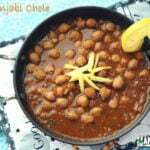 Serve hot chole with rice or kulche. * Adjust spice level to taste. The chole masala is a mix of several spices and is easily available in all Indian stores. This masala already has red chilli powder in it and that is why I did not add any extra. If you love spicy food, I would recommend adding some extra red chilli powder here. 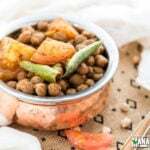 * Skip the first step of pressure cooking the chickpeas if you are using canned chickpeas. Add them straight to the wok and mix with spices. 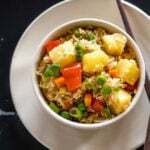 * To make this vegan, skip the ghee and use only oil in the recipe. 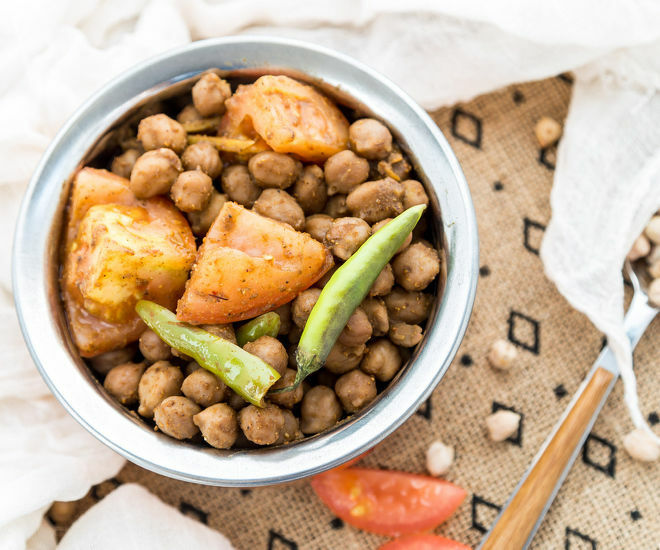 Kadai Chole - dried chickpeas flavored with lots of spices. Perfect with Indian breads. 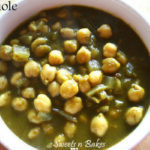 Soak 1 cup of raw chickpeas in water for 6 hours or preferably overnight or use 2.5 cups of canned chickpeas. Heat ghee or oil in a pan on medium heat. Add little water [around 1-2 tablespoons] so that the spices do not get burnt. Add the cubed tomatoes and mix. Cook till tomatoes are little cooked, say around 2-3 minutes. You don't want to them to be mushy. 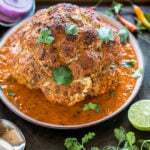 Switch off the flame and garnish with coriander leaves (optional). 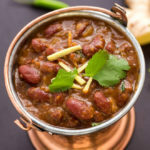 Serve hot chole with bhature or kulche. Amazing!!! 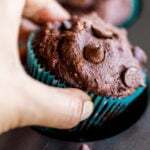 Perfect as a snack! Love the step by step photos!! !